ViewSonic Pro8200 review | What Hi-Fi? The ViewSonic Pro8200 is a decent option if you’re on a tight budget: prices vary online from £600 to £760. It’s a good bargain compared with rival sub-£1000 projectors, such as the £850 BenQ W1080ST and the £900 Epson EH-TW5910. The trade off for a lower price is less picture subtlety, but the American company still shows it’s a dab hand at making HD projectors. The Blu-ray of The Great Gatsby shows off the ViewSonic Pro8200’s bright picture. The glittering jewels, fireworks and light-coloured clothes shine brightly, conveying the breezy, summery atmosphere of the film. There’s good texture to the kaleidoscope of colours, and the Pro8200 does particularly well with natural-looking skin tones. It could do with a good helping of subtlety and clarity, but a more pressing problem is the rather poor contrast. Black areas and shadows merge together to form indistinguishable patches of grey that rob the picture of depth and punch. This doesn’t bode well for moody-looking films such as Constantine, or any of Christopher Nolan’s Batman trilogy. You do see more detail pushing through the greying blacks – such as the pinstripes and seams on black suits – but object edges are ill defined, there’s a lack of depth in dark scenes, and the picture loses a lot of excitement in the process. The ViewSonic does fare better with brighter, more colourful films such as Gatsby or The Adventures of Tintin. It does well with greens and yellows, but struggles with complex shades of red. And while the whites could be even crisper and cleaner, they do liven up the otherwise drab picture. Lamplights and shiny reflections glow nicely against muted blacks. Motion stability is another issue, with long panning shots across the screen peppered with stutters and shakes. The fast-paced action sequences in the execrable-yet-brilliant Fast and Furious 6 aren’t smooth and stable enough to be fully exhilarating. A THX Optimzer disc helps to sharpen up the picture as much as it can. ‘Standard’ mode looks the best. Switching to ‘Theatre’ plunges black levels into inky darkness, but swallows up far too much detail in the process. There is a glossy sheen to the picture, too, adding a touch of film noir-like flair to the picture. Ultimately, we prefer the ‘Standard’ mode’s bright picture and more natural tones. There’s no 3D, but we don’t miss the feature too much. Full HD compatibility and upscaling to 1080p is the main focus of the Pro8200’s specifications – good news for your Blu-ray and DVD collection. There are two HDMI inputs for your sources, as well as two PC inputs for connecting to computers. Component, composite and S-video inputs round up the analogue connections for this projector. 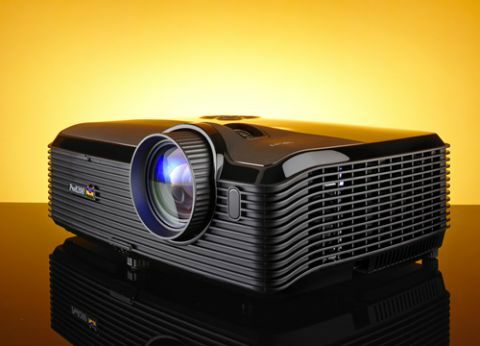 The Pro8200 cuts a blocky form, but it’s a solidly built projector. The small remote control has a matching black finish, but it’s the bright blue backlight we like most. It makes it easier to use the remote in a pitch-black home cinema room. Setting up the projector is swift and painless as well. There are built-in speakers, but they sound insubstantial and tinny at best. Obviously, we urge you to invest in a decent speaker package. It doesn’t need to be extravagant – the compact Tannoy HTS-101 Award-winner (£400) will deliver ample dynamics and detail. The ViewSonic Pro8200 has its ups and downs. There’s enough detail to keep you watching, and has a lively way with brightness that’s pleasing to watch. However, the poor contrast is a big issue. Not only do black levels look grey, colours aren’t as punchy or subtly shaded. The price is its main attraction, but there are far more capable and exciting projectors if you spend just a little bit more.